Notes: English version. 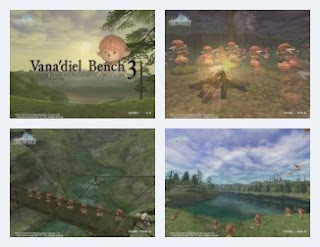 Also known as "Vana'diel Bench 3." The popular long-running RPG series steps away from its single-player console roots with Final Fantasy XI, an MMO set in the world of Vana'diel. The benchmark shows off the lush world with nice dissolve transitions and typical FF-style music. Running time was probably a bit too long for what is basically a series of moving postcards. A separate "Demonstration" mode acts as a real-time trailer, packed with action shots, but sadly not benchmarked. Good framerate throughout. Recommended.